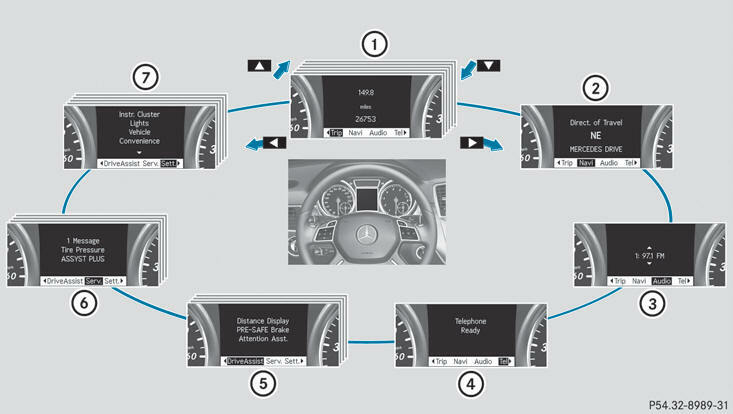 The number of menus shown depends on the optional equipment in the vehicle. the steering wheel until the Trip menu with odometer 1 and trip odometer 2 is shown. The values in the From Start submenu are calculated from the start of a journey, while the values in the From Reset submenu are calculated from the last time the submenu was reset. From Start or From Reset. - the ignition has been switched off for more than four hours. - 999 hours have been exceeded. - 9,999 miles have been exceeded. When 9,999 hours or 99,999 miles have been exceeded, the trip computer is automatically reset From Reset. current fuel consumption and approximate range. - Trip computer "From start" - Trip computer "From reset"
In the Navi menu, the multifunction display shows navigation instructions. For more information, see the separate operating instructions. – Switch on COMAND (see the separate operating instructions). 4 Symbol for "follow the road's course"
When a change of direction has been announced, you will see visual distance display 2 next to the symbol for the change of direction 3. This decreases in size as you approach the announced change of direction. On multi-lane roads, lane recommendation 3 may be shown for the next change of direction. Lanes may be added during a change of direction. - New Route... or Calculating Route: a new route is being calculated. - Off Map or Off Mapped Road: the vehicle position is outside the area of the digital map (off-map position). - No Route: no route could be calculated to the selected destination. SIRIUS XM satellite radio acts like a normal radio. You can only change the waveband and store new stations using COMAND. – Switch on COMAND and select Radio (see the separate operating instructions). – Switch on COMAND and select the audio device or medium (see the separate operating instructions). button, the rapid scrolling speed is increased. Not all audio devices or media support this function. If track information is stored on the audio device or medium, the multifunction display will show the number and name of the track. – Switch on COMAND and select video DVD (see the separate operating instructions). You can establish a Bluetooth® connection to COMAND (see the separate operating instructions). A driver's attention to the road must always be his/her primary focus when driving. For your safety and the safety of others, we recommend that you pull over to a safe location and stop before placing or taking a telephone call. If you choose to use the telephone while driving, please use the handsfree device and only use the telephone when weather, road and traffic conditions permit. – Switch on the mobile phone and COMAND (see the separate operating instructions). You will see one of the following display messages in the multifunction display: - Telephone Ready or the name of the network provider: the mobile phone has found a network and is ready to receive. - Telephone No Service: no network is available, or the mobile phone is searching for a network. steering wheel to accept an incoming call. If you are not in the Tel menu, you can still accept a call. If you are not in the Tel menu, you can still reject or end a call. If your mobile phone is able to receive calls, you can search for and dial a number from the phone book in COMAND at any time. second. After a short time, the rapid scroll speeds up. This function is only available with DISTRONIC PLUS. steering wheel to select the DriveAssist menu. The DISTRONIC PLUS distance display appears in the multifunction display. Active Parking Assist symbol will be displayed instead of the symbol. the multifunction display when the ignition is on. You can use the Blind Spot Asst. function to activate or deactivate Blind Spot Assist (Y page 198) or Active Blind Spot Assist. You can use the Lane Keep. Asst. function to activate/deactivate Lane Keeping Assist (Y page 200) or Active Lane Keeping Assist. – Press the button to confirm. The Display Unit Speed-/Odometer: function allows you to choose whether certain displays appear in kilometers or miles. steering wheel to select the Settings menu. The Permanent Display: function allows you to choose whether the multifunction display always shows the outside temperature or the speed in km/h (USA) or mph (Canada). You will see the selected setting Outside Temperature or Speedometer [km/h]:. lamps are switched on automatically during the day when the engine is running. RSurround lighting: the exterior lighting remains lit for 40 seconds after unlocking with the key. If you start the engine, the surround lighting is switched off and the automatic headlamp mode is activated. RExterior lighting delayed switch-off: the exterior lighting remains lit for 60 seconds after the engine has been switched off. If you close all the doors, the exterior lighting goes off after 15 seconds. Deactivating delayed switch-off of the exterior lighting temporarily: – Before leaving the vehicle, turn the SmartKey to position 0 in the ignition lock. – Turn the SmartKey to position 2 in the ignition lock and back to position 0. If you activate the Interior Lighting Delay function, the interior lighting remains on for 20 seconds after you remove the SmartKey from the ignition lock. function, the vehicle is centrally locked above a speed of around 9 mph (15 km/h). For further information on the automatic locking feature. If you switch on the Acoustic Lock feedback function, an acoustic signal sounds when you lock the vehicle. You will see the selected setting: On or Off. USA only: This device has been approved by the FCC as a "Vehicular Radar System". The radar sensor is intended for use in an automotive radar system only. Removal, tampering, or altering of the device will void any warranties, and is not permitted by the FCC. Do not tamper with, alter, or use in any non-approved way. You can use the Easy Entry/Exit: function to activate or deactivate the EASY ENTRY/EXIT feature. For further information on belt adjustment. If you switch on the Fold Mirrors in when Locking function, the exterior mirrors fold in when you lock the vehicle. If you unlock the vehicle and then open the driver's or frontpassenger door, the exterior mirrors fold out again. If you have switched the function on and you fold the exterior mirrors in using the button on the door, they will not fold out automatically. The exterior mirrors can then only be folded out using the button on the door. Mirrors in when Locking: function. For safety reasons, the Daytime Running Lights: function in the Lights submenu is only reset when the vehicle is stationary.